2. You paint the interior of your mom's new house. 3. Your mom has surgery. 4. You schedule surgery for yourself. 5. Your dog grows some weird lump on her chest and it keeps getting bigger by the day. 6. Your daughter goes to camp for a week. 8. Your son starts behavior therapy. 9. Your son gets what you think is a urinary tract infection, but after a doctor visit and a pee sample you find out it's a too-much-soap-in-his-bath-infection, but he gets a prescription for antibiotics anyway, because he's that kind of kid. 10. You get chosen to have your writing honored at a gala reception. 11. You struggle to find something to wear to said reception. 12. You make sure to get your Ambien refilled. 13. You still don't sleep. My eleven year old daughter is leaving today for a week at camp. Oh, sorry. My eleven-and-a-half year old daughter, because if you don't add the 'half' then you will get an eye roll. And, sometimes, a hair flip. I went to this same camp in the sixth grade and had so much fun that, as the school bus pulled away from the cabins on the last day, I looked out the back window and cried as the lyrics to Dan Fogelberg's "Longer" danced in my head. The whole scene was like a bad, after-school special. I know my daughter is going to have a great time. She is going to make new friends, have experiences she will remember forever and, so help me, none of those experiences had better include boys or someone is going to get hurt. But, knowing she is going to have a fabulous week doesn't mean I'm going to miss her any less. She has been to overnight camp before, but never for a week. Sure, there will be less arguing and we won't run out of milk as quickly, but not kissing her forehead before she goes to bed each night is kind of going to make my heart hurt. Of course, I knew she would feel the same way. Which was almost evident when I asked, "Are you going to miss us?" The kids and I went to pick up a pizza earlier this evening and as we waited in the crowded counter area, I looked down to see my son vigorously rubbing his nose. I had seen this before. This was the booger rub. I looked around for a napkin, but there were none in sight. I didn't want to be standing among a group of people, who were picking up their dinner, and see a green glob on my son's knuckle, so I nudged him and quietly requested, "Hey buddy, why don't you wait until we're in the car to do that?" And, not realizing that this was something he should do with a bit of modesty, he loudly replied, "You mean I should wait until we get in the car to pick my nose?" Yeah, that's right...and we're going to pass on those green peppers. A couple of days ago, I sat down with my husband and kids to watch an Oprah rerun featuring Dr. Oz. He was discussing the diabetes epidemic in America. I wanted my 11 year old daughter to see the show, because she loves food that is horrible for her. If I let allowed it, she would eat doughnuts for breakfast, bologna on white bread for lunch and chicken nuggets for dinner. With extra dipping sauce. I don't let her. I buy plenty of fruits and vegetables, whole wheat bread and pasta and she is not allowed to drink soda unless it's a special occasion or if she sneaks one at a friend's house. Don't think you're fooling me, girl. She is in the 50th percentile for height and weight. She is healthy. For now. I wanted her to see that, given the opportunity, she needs to make her own good decisions about nutrition. I don't want her to end up like me. I can't even keep sweets in the house because I have no self-control. If only I was as obsessed with laundry as I am with sugar. No one would ever run out of underwear. My eight year old son loves all food. My mom can't believe it. Really, it's like a grandparents dream come true. He never asks what's for dinner, he just sits down and starts eating everything on his plate. He weighs 42 pounds, so I'm pretty sure he's just trying to bulk up. My boy craves pine-nut hummus and red peppers. He eats blueberries and raw veggies like they're going to stop harvesting them. Given his congenital heart disease, this is a good thing. At the risk of losing readers who are also PETA members, I will admit that I have long said that I would be a vegetarian if someone else did all the food prep. All that washing and cutting...ugh. I don't think my son would complain if I put him on a vegetarian diet either. Of course, he enjoys chocolate too. He's a lot like his mother. Someday, he is really going to like beer. My eight year old son has many oddities, however none is quite as evident as his fascination with skin. He loves to touch people and the older, the better. The upper arm flab of elderly women is his clear favorite. My boy has had sensory issues from the start. As an infant, he hated to be held and only due to countless hours of occupational therapy did that change. Now he can't keep his hands off of people. He has always been able to obtain this tactile fix because he is so small, but what people don't realize is that he's really just a miniature man. The lady who lets him climb all over her lap forgets that he is an eight year old in the body of a toddler. The kid gets away with murder, I tell you. We have recently started some new therapy. We brush his skin, we do joint compression and other exercises which are helping him keep his hands to himself. As he always has been, my child is a work in progress. Most of our friends and family know they have to set boundaries and I do my best to keep him away from bikini clad women. Though, that isn't hard because I've been doing the same thing with my husband for over 15 years. Practice makes perfect, I always say. We tell my son that everyone has a bubble and that he is not allowed to get close enough to pop it. I sound like I'm off my rocker when I see him eyeing a smooth shoulder or a college co-ed in short-shorts and I act preemptively saying, "Bubble. Bubble! BuuuuuuBBBBBBLE!" Of course, there are times when he's bound to fall off the wagon and we are quick to tell him that it's not okay to invade someone's space. But, there are still occasions when, oh...let's say, he might lie on top of our friends' eight year old daughter. Hypothetically. We told him that it was unacceptable for him to lie on top of his friends and that you can never touch a girl without permission. This is when his big sister chimed in and said, "Yeah! You can go to jail for that!" Which is why I shouldn't have been surprised at my son's reaction when we ran into my brother-in-law the other night. My brother-in-law the police officer. At least we know my kid has one redeeming quality...he is honest to a fault. Which was clearly evident when he pulled me down to his level and whispered, "Hey, Mom. You should probably tell him that I lay on girls". Exactly three weeks from right now I will be on my way to New York City. By myself. On a train. I will have nine hours to do as I like. I can listen to music, get a drink from the dining car and write. I can even read a book without interruption. Gasp! Maybe the clickety-clacking will sing me to sleep. Though, I hear the scenery is beautiful on this trip. I may not want to miss it. I am thrilled for the opportunity to travel through small towns and end up in one of the biggest cities in the world. From the mid-west to the east coast. From apple orchards to the Big...well, you get the idea. And, so help me, if there is a talker sitting next to me I'm going to have to throw them off the train. My family is Catholic and that means that summer festivals are upon us. If you have never been to a church festival you are missing out. There are rickety rides that are run by slightly inebriated carnies and there are games where your kids can walk away with fine prizes like Chinese yo-yos and rubber ducks. Together these will only cost you twenty tickets! There are local musicians, beer trucks, bratwurst and gambling. The air smells of cotton candy, bug spray and sweat. Mmm. And, when it gets late in the evening, there are teens and preteens running about. Well, they're mostly just standing in large packs and their hormones are doing all the running. As much as it pains me to say this, my daughter is a preteen now. I keep telling her to stop growing up, but she won't listen to me. Typical. My daughter is such a good kid, and is so studious and smart, that yesterday, I heard my husband tell her to, "Put down your book and play Mario with me!" but, she is still a girl. I know for a fact that she has a crush on Taylor Lautner. 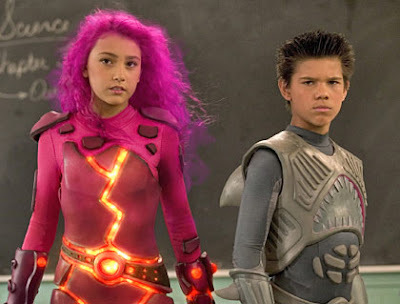 I totally caught her watching The Adventures of Sharkboy and Lava Girl the other night. Given these facts, I don't think I was out of line when I questioned her the other night about her intentions when we visit these festivals. I sat her down and asked, "So, are you going to be walking around in clumps of giggling girls this year? Are you going to be following the boys wherever they go?" She replied, "Why would I do that? If you follow the boys around you just get less time on the rides." See? I told you she was smart. 1. When it's almost 100 degrees and your son wants to walk around wearing nothing but underwear all day, you might just let him. 2. And, you might join him. 3. Which can be awkward when the Fed Ex guy rings your doorbell. 4. The row of zits across your hairline caused by perpetual sweat beads will try hard to outdo the mosquito bite on your forehead. 5. Then you may find yourself wishing you still had bangs. 6. Two panting dogs can make a real mess. 7. It's possible to drink 10 glasses of ice water in a day and still feel like there is sand in your mouth. 8. When it's time to leave your son's baseball game and you see everyone stand up and do a little shimmy, you may think they're dancing. 9. But, they're really just trying to dry out their crotches. On July 4th, 1998, I found out I was pregnant. My period was a couple of days late and there was a huge jug of vodka and cranberry waiting at a party with my name on it. Late periods and vodka don't mix, so I took a test. Don't worry, friends don't let friends' liquor go to waste. My husband and I had closed on, and began to renovate, our first house in February, 1998. We got a puppy in May and the pregnancy news came just before our first anniversary that August. At the time, we both had great jobs. We both worked together for a successful local business. It was a mom and pop corporation...big responsibilities with a family atmosphere. It was intense work, but I enjoyed it. Just before Christmas that year, my pregnant self said goodbye to my co-workers for an extended holiday vacation. I never came back to work. Our daughter was born 10 weeks early on December 29th. One preemie led to two and that second one? Well, he came complete with problems galore. I stopped working in the corporate world and, instead, became a nurse, physical therapist, occupational therapist and occasional Heimlich provider. I walked around with a phone attached to my ear listening to a permanent loop of health insurance voice systems. Two years ago, when my son was in Kindergarten, I was offered a unique opportunity to work at the school as a teacher's aide during the hours he attended. It worked out great. And last year, when he was at school all day and eating in the cafeteria for the first time, I became a lunch lady. That Heimlich thing? Well, it doesn't always work if you're not there to do it. But, now my son is going into the second grade. He has made advances we never thought possible, one of which is clearing food from his mouth before he chokes on it. My daughter will be in middle school and my mom recently moved back to our neighborhood after many years away. Clearly, I'm running out of reasons to hang out with my children all day. As much as I would love to be a housewife, take care of my home and laundry, plan meals and otherwise be organized instead of chaotic all the time, those things don't pay the bills. We have been struggling for a long time. My car is 13 years old and sometimes the doors don't open and the horn doesn't work, which totally gets in the way of me telling people what bad drivers they are. Our washer and dryer are not long for this world, our computers are starting to implode and the stove is like a hormonal woman and only cooks when it wants to. I have committed to the school until 2011. Basically, I have a year. I have a year to decide what I want to be when I grow up. I am almost 40 and though I'm not afraid to go back to school, I just don't know what I want to do when I get there. I want to write, I want to design, I want to be creative. I want to be passionate about something in the way I have been passionate about my children. I want to be fulfilled. I also want to pay the bills and I just don't know if the two go hand in hand. Five cans of green, spray paint: $24.00. Two gallons of white, ceiling paint: $38.00. One box of sand for texturizing: $4.00. Ending up with one white toe and permanent flip-flops: Priceless.